Compassion Over Killing’s brave investigators shine a light on the cruelties kept hidden behind the closed doors of animal agribusiness. COK investigations have resulted in animal cruelty charges, groundbreaking lawsuits, and even slaughterhouse shutdowns. To give you an idea of what our investigators experience, we’re publishing a series of blogs by former COK investigators. Not only are you unnecessarily killing someone who does not want to die, but there is no way to fully protect against accidents or disgruntled employees. Why even take the chance? Leaving animals off of our plates is the only way to really ensure that no one is mis-stunned or mistreated. During the early hours of the morning on September 10, a pig tried to escape from a slaughterhouse. When a worker failed to properly stun — or render unconscious — the pig with a captive bolt pistol to the head, the pig stood up, panicked, jumped over a 3-foot high rail surrounding the stunning area, and escaped outside into a field. The Massachusetts facility aptly named Blood Farm, received a suspension from the USDA for violating the Humane Methods of Slaughter Act. This law requires all non-religious slaughterhouses to stun animals before slaughter, and the first stunning attempt must be successful. What’s surprising about this story, aside from the pig’s heroic attempt to escape death, was that Blood Farm was actually cited. In fact, despite the company’s website touting their “Humane Handling Program” and their desire to “avoid stress on the animal”, the facility has garnered four USDA citations since August 2017. I’ve seen horrors that should have easily constituted violations of the Humane Methods of Slaughter Act and resulted in USDA enforcement actions. 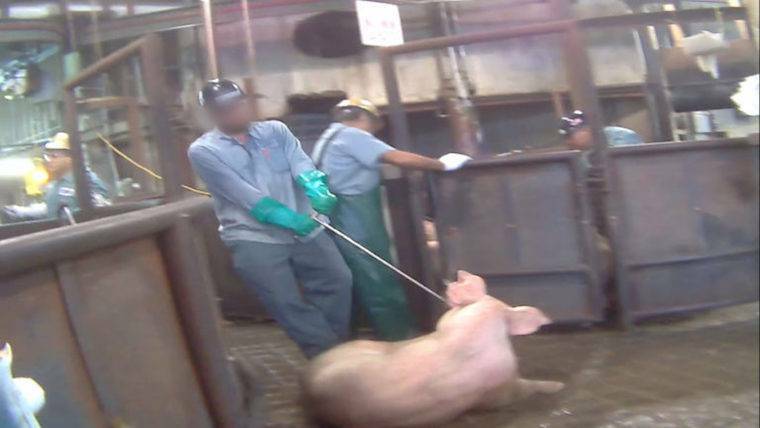 But, despite the video evidence I collected as an undercover investigator, none of the slaughter plants I’ve worked at were cited for any of them. Of course, I know the USDA does issue enforcement actions — we see four of them for Blood Farm — but these are infrequent. The vast majority of violations go by undetected, perpetrated during the long periods of time USDA inspectors were absent. What happened at Blood Farm isn’t an exceptional case. I’ve seen my fair share of failed stunning attempts. I once worked at a pig slaughterhouse in Minnesota that supplies Hormel. I remember sick and injured animals, too weak to go through the chutes with the rest of the herd. They were pulled off to the side and stunned separately. Some of them were dispatched with the first shot of a captive bolt pistol, but several of them continued to thrash about on the ground–still conscious after the first blow. The workers, under pressure to work quickly, wouldn’t even bother to stun them again before shoving a hook in their mouths and dragging them away. One was never even stunned before the hook was inserted. They reminded me of fish on an angler’s line, struggling fruitlessly as they were pulled slowly towards death. This is the reality of slaughter. Employees are pushed to work as fast as possible, inevitably leading to mistakes or inhumane shortcuts that are costly for the animals. There’s no happy ending. The pig at Blood Farm was captured, stunned again with a captive bolt pistol to the head, and killed. There’s no such thing as humane slaughter. Not only are you unnecessarily killing someone who does not want to die, but there is no way to fully protect against accidents or disgruntled employees. Why even take the chance? Leaving animals off of our plates is the only way to really ensure that no one is mis-stunned or mistreated.